﻿ Muong Thanh Grand Da Nang Hotel (Vietnam) | FROM $39 - SAVE ON AGODA! Have a question for Muong Thanh Grand Da Nang Hotel? "In general, the rooms were fine, services were good." 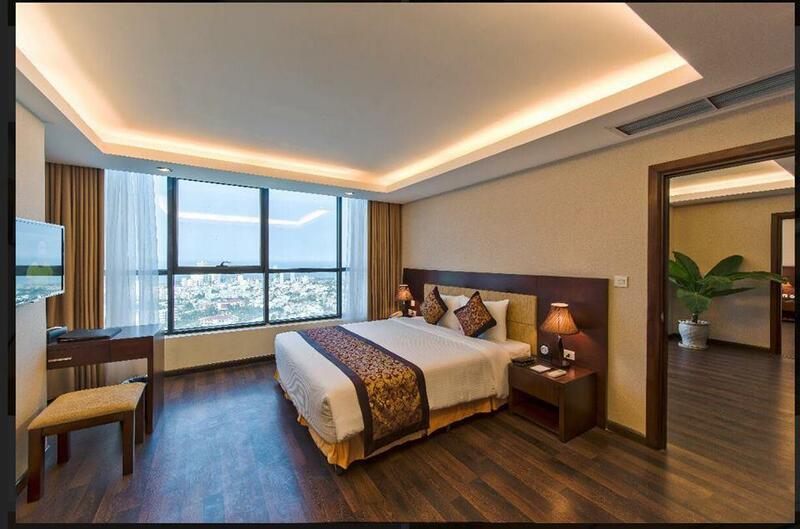 If what you're looking for is a conveniently located hotel in Da Nang, look no further than Muong Thanh Grand Da Nang Hotel. The hotel is three kilometers from the city center, and it normally takes about 10 minutes to reach the airport. For those of you who want to venture out, Han Local Market, Chicken Church, and Han River Swing Bridge are just some of the attractions available to visitors. 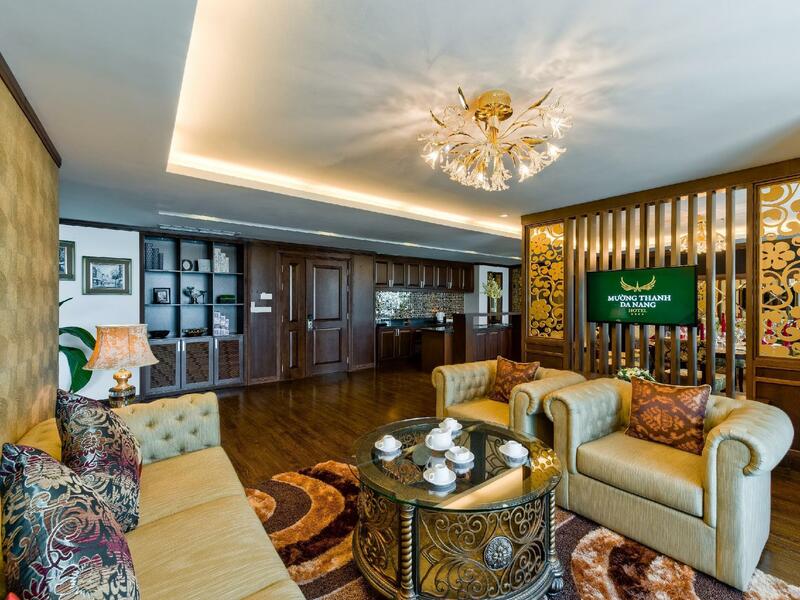 Muong Thanh Grand Da Nang Hotel offers impeccable service and all the essential amenities to invigorate travelers. Top features of the hotel include a smoking area, Wi-Fi in public areas, a business center, room service, and laundry service/dry cleaning. Guests can choose from 378 rooms, all of which exude an atmosphere of total peace and harmony. The hotel's recreational facilities, which include a spa, sauna, indoor pool, massage treatments, and fitness center, are designed for escape and relaxation. 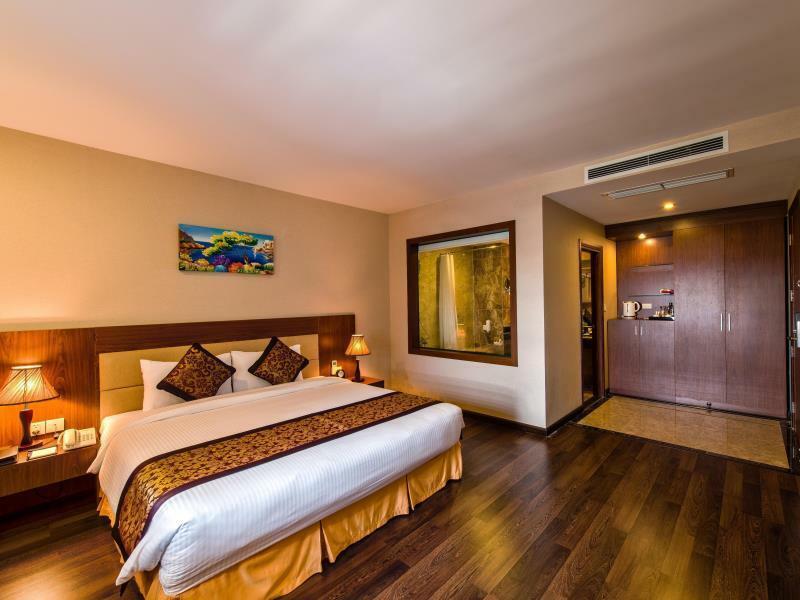 Muong Thanh Grand Da Nang Hotel is an ideal place of stay for travelers seeking charm, comfort, and convenience in Da Nang. "Very big room, locate in the city center." - early check-in before 06:00 AM: charged one night. - early check-in from 06:00 AM to 09:00 AM: 50% of the room rate per night (breakfast included). - check-in from 09:00 AM to 02:00 PM: 30% of the room rate (breakfast excluded). - from 12:00 AM to 03:00 PM: charged 30% of the room rate. - from 03:00 PM to 06:00 PM: 50% of the room rate. - after 06:00 PM: 100% of the room rate. Children under 6 years old stay for free with breakfast provided if using existing bed. Children 6-12 years old will be charged VND 120,000 per child per night when using existing bed. The rooms really strong smell of moist, damp , mold . It was raining outside and the rain was leaked through the windows. The wall below the windows all wet , damp . The bathroom is another issue, when you take a shower water run over the bathtub down to the floor make the bathroom flooded . Was great. Huge room. From 24th floor room I enjoyed view of river, mountain and ocean. Friendly staff. The massage service was excellent. As someone commented the shower drainage was very poor. It flooded the whole bathroom, the only negative. The stay is great!! They upgraded my room for free upon my arrival. The room was huge and clean with great views, although the air conditioner is definitely under sized. The variety of breakfast is great and staff were professional. The provision shop/eat house besides the hotel is superb and their stingray is a MUST try, the owners were friendly too. The hotel is in the centre of all attractions: Son Tra, beaches, Ba Na, Marble Mountain and Hoi An... Strongly recommended hotel! Very pleasant hotel ~15 minutes from airport. Staff is friendly and can speak English. Rooms are clean and big enough. The soundproofing could better. We could hear our neighbors voices and TV. The swimming pool (too cold !!) and fitness are free. On the same floor, you can get massages for reasonable price for Vietnam ($10). The breakfast is good with many choices and the staff in the restaurant is attentive. Can rent scooter. Very positive stay. I have made a reservation in this place, but i was picked twin bed instead of double bed ( business trip alone). I found my mistake after completed Reservation (2-3mins) and ask them for amend my booking. However they denied even with Agoda cs help. Never comeback here !!!! Dear Mr.Hạnh Thank you for interest and choosing Muong Thanh Grand Da Nang, We received your booking is Deluxe Twin from Agoda. We upgaded you Deluxe Family Tripple We didnt know you need 1 bed room before and and received your any request. But we stil willing to change the room as your request. Thank you your reivew. Looking forward to come back. Foods are bad. Rooms have mold on walls. Bathroom always has urine odor even after they cleaned. They don’t use bleach or cleaning products. Their towels always have the mildew odor. They need to have professional training in cleaning and sanitizing if they want more international tourists and return customers. Only they have here are polite staffs. The room is very nice and with great view. However, the hot water doesn't last very long if you like to have long shower. Not walking distance to beach. Would be nice if hotel offers shutter bus. Buffet breakfast was awesome so many choices. We were disappointed such big hotel without a sauna. Very helpful friendly staff. you always know what you are going to get at a Moung Thanh hotel, give or take. Would recommended if on a deal but wouldn't pay full price. I have stayed at the Hotel at several occasitions. This time the Stay was without any flaws. Nice and clean as always. Breakfast Buffet as always perfect. Havent really used any of the facilities at the Hotel during my stays. But,,,a nice and clean Hotel,,a bit high priced compared to many other Hotels,,, But,,you pay for a very very good wiev,,a nice location,,,nice Buffet,,,spotless cleaning service ETC. You get something for the extra money you pay for a stay at this Hotel. Will not hesitate to come back to this place. It was a good place. But the front door was repairing at the time I checked in. The coffee bar at 23rd floor was messy and dirty. Come to the massage floor and you will be surprised. Next time, you should stay in Muong Thanh Hotel on Pham Van Dong Street. So that you can walk to the beach easier. This Muong Thanh Hotel on Ngo Quyen street is not a good place for traveler who love to walk. Coincidentally there was Korean group and the system to sit guest are a bad experience to me and my colleagues. We waited at lift lobby and was ask to be seated or leads to.. hours tour just seat wherever they wanted and even took my colleagues seats while she is away getting food hence we need to give up tables and continue to wait for another table. It took us 10mins to wait and walk around to look for a table.